Watford academy boss Nick Cox has hailed their youth development system as a major success after their 50th graduate made his first-team debut. Striker Britt Assombalonga played in Saturday's 0-0 draw with Coventry. "It's always a fantastic day when one of your boys makes his debut but for him to be the 50th makes it that little bit more special," Cox told BBC Three Counties Radio. "Everybody who has been involved over the years is delighted, definitely." 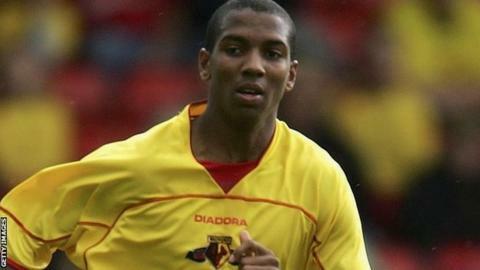 The Championship club's current academy set-up has been in place since 1998, with England winger Ashley Young their biggest success so far after joining the club as a schoolboy and making his Hornets debut in 2003. Young moved on to Aston Villa four years later before joining Manchester United for a reported £17m in June last year. England Under-21 striker Marvin Sordell, who was sold to Bolton for an undisclosed fee on transfer deadline day, and defender Adrian Mariappa are others to roll off the academy production line. Mariappa, 25, remains at Vicarage Road after the club rejected offers from Newcastle and Wigan during the transfer window, but is sure to be the focus of renewed interest from Premier League clubs over the summer. It is too early to say whether 19-year-old Assombalonga will make a similar impact. But Watford have made good use of the loan system to aid his development and he did not waste the opportunity, scoring 11 times in 15 games for Ryman Premier club Wealdstone and five goals in as many games for Braintree in the Blue Square Bet Premier. "His story is in keeping with the traditions and the DNA of this club," said Cox, who has worked at the academy in various roles for the past decade before taking over as head last summer. "He came through the community scheme very late as a 17-year-old, then progressed into the academy before going on to make his debut, so that really encompasses everything this club is about with regards to youth development and being a family club. It's a good story to hit 50 with." Assombalonga was sent to Wealdstone and Braintree to "challenge him", according to Cox, because he was finding youth team football "comfortable". He continued: "We make it clear to the boys that there is a stigma attached sometimes to going out on loan, in that you're sent out because you're not needed any more. "Here, it works very much the other way. "We see it very much as part of the boys' development - a stepping stone from playing development games to professional games, where three points are vital and crowds are going to scream and holler at them, so it's something we'll continue to do." Numerous clubs now have academies in place, but Cox believes Watford's record of producing players is matched by very few. "I don't know where we would rank with regard to the number of debuts, but I'd be very surprised if there was another club to hit 50 in the last 12 years," Cox added.